2 Why Do You Need A Parts Bin? If you’re like me, a good gun cleaning session can create quite the mess. I tend to go a bit overboard with the solvent, and usually end up with a puddle of it on the table next to a pile of dirty rags. I also have a tendency to make small nicks and gouges in the table when I’m driving out pins or gently persuading that stubborn part into place with a small hammer. Thankfully, I have 2 large dedicated gun cleaning tables in my basement, but most people aren’t that lucky. If I was completing my gun cleaning at the kitchen table, counter, or any other place that my wife uses, I would absolutely have to have a gun cleaning mat. Gun cleaning mats do a great job of preventing excess oil and solvent from getting onto your table, as well as cushion the blows of any hammers and preventing any nicks and gouges. The fact of the matter is, unless you want to lose your gun cleaning privileges, you are going to have to pick up a gun cleaning mat. Thankfully, there are plenty of great options out there for you, and they are pretty affordable as well! If you would like to learn more about how to choose the best gun cleaning mat for you, keep reading! When you first start looking for the perfect gun cleaning mat for you, the first thing to decide is the size. You need to ask yourself, what kinds of guns will I be cleaning on this mat? If the only firearms you own are handguns, then you are not going to need a full-length cleaning mat. On the flip side, you also might struggle to find a mat large enough to fit your competition shotgun with a 30-inch barrel. You will need to make sure that your mat is not only long enough to fit your whole firearm, but also gives you ample room to place your parts. Once disassembled, your firearm is going to take up much more space than it does when it’s put together. You will need to make sure that you have plenty of room on the mat to lay all of the parts out neatly and in order to make sure that you can easily assemble your firearm. Gun cleaning mats come in a wide variety of materials in different price ranges. They also have different levels of hydrophobia (how well it repels liquids). Personally, I prefer a mat with a very high level of hydrophobia, such as a plastic or silicone mat. These don’t offer much in the way of cushioning but are much easier to clean up and wipe away excess solvent once you are done. On the flip side, a material such as waxed canvas or leather won’t offer much in terms of solvent repellent but is great for cushioning. Conversely, if an absorbent mat is something that you actually want, they make plenty of absorbent mats that are designed to soak up excess fluids. These are good if you are afraid of liquids running off the mat and on to your table. Probably the most popular material for a cleaning mat is neoprene. This is a pretty common material that is often used to make mouse pads or waders. It offers a great cushioning ability and a pretty good resistance to solvent absorption. It is also fairly cheap and easy to manufacture and is easy to print images on. For all of these reasons, you will find that a vast majority of the cleaning mats on the market are made from neoprene. Even though I usually prefer to use a silicone mat, a good neoprene mat is a great place to start. Why Do You Need A Parts Bin? The addition of a parts bin can be one of the most important features of a cleaning mat. If you’ve ever taken apart a firearm, you know that there are often many small parts that are incredibly easy to lose. Many of the parts bins on cleaning mats are simply a shallow plastic dish with a magnet in it. Since almost every gun part is going to be made of metal, this is a fantastic system! In fact, I like to have several shallow magnetic dishes on my gun cleaning table anyways. I can’t count the number of times that I have had a mild heart attack when that incredibly tiny spring or pin wasn’t where I left it. Small parts like these are notorious for rolling around and off the table, and I consider a small parts dish to be an absolute necessity. Tool storage is another huge benefit to a gun cleaning mat. You will find that some cleaning mats actually include storage for almost your entire gun cleaning kit! This can be incredibly handy for those who don’t have much space to store their gun cleaning supplies, or who want to be able to take everything with them to the range. These mats usually will roll up into one compact bundle, which makes things very convenient. The downside to this though, is that these mats are usually only in the higher price range of cleaning mats. Those of you who have more money in your wallet than space in your house might find this style of mat to fit your needs perfectly. So you have decided how large your mat needs to be, what material you want, and found one that has the exact storage options you need. What’s next? Customization of course! Most gun cleaning mats are made of a material that is easy to print images on, and you can get almost any image you want on a gun mat! 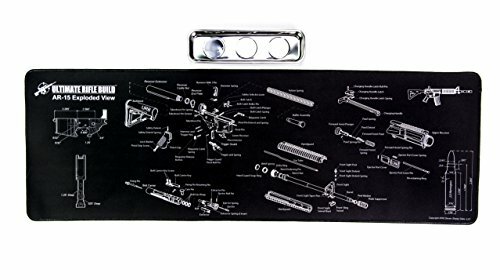 Personally, my favorite prints on gun cleaning mats depict an exploded parts diagram of the firearm you are working on. This can really come in handy during reassembly after cleaning. These types of mats are pretty popular and fairly easy to find and come in most of the more popular platforms of firearms. Glock, AR-15, and 1911 are 3 of the most common prints to be included on mats like these, but with a little work, it isn’t hard to find a print of your very own firearm. If this style of mat doesn’t trip your trigger, there are also a wide variety of other prints available, such as American flags. If the thought of a print doesn’t amuse you, it is also easy to find mats that are just a plain color. If you are a fan of the AR-15 platform of rifle and are looking for a mat on which to clean your tactical carbine, then you are going to want to check out this nice mat from Ultimate Rifle Build. It features a waterproofed polyester top that covers a natural tree rubber back for a solid, waterproof, non-slip mat. It also comes in two different sizes, with the largest being 36 inches long by 16 inches tall. This should be enough to clean even the largest firearm in your collection and give you plenty of space to lay out all of your parts and tools. One disadvantage of this mat is the material type. While it is almost exactly the same as a neoprene mat, it is rather thin at only ⅛ inch thick. This should be more than adequate for protecting your surface from light hammer blows, but I wouldn’t trust it for driving out stuck pins on the kitchen table. It is also a foreign made imported mat, but it is all in English and every part is labeled correctly. The stitching on the side of the mat is also a nice feature and adds an extra level of sturdiness to the mat. All things considered, if you are looking for a great mat to clean your AR-15 on, this is it. 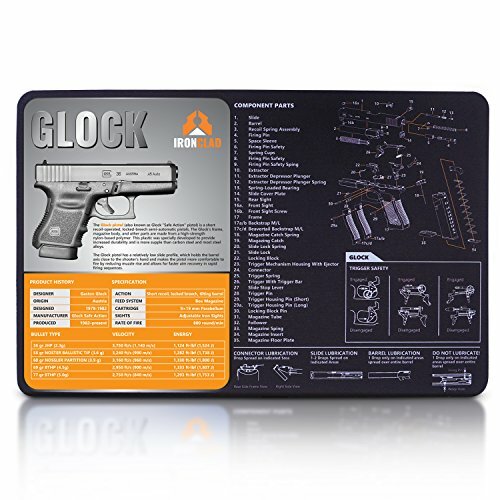 If you are looking for a good gun cleaning mat for your handguns, then this may be a good mat to start with, especially if you have a 9mm Glock. This Ironclad mat is 3mm thick and made of neoprene but is only 17 inches long by 11 inches tall. This is a great feature if all you want to clean is handguns. This mat provides plenty of space to lay out all of your handgun parts, and it’s shorter length will give you much more flexibility when it comes to where you clean your guns. It will also roll up to be much more compact than any rifle cleaning mat, which can be a pretty big bonus for apartment dwellers or anybody else who doesn’t have much space for their gun cleaning supplies. One of the main attractions of this mat is also one of it’s biggest pitfalls. While the size of this mat is perfect for cleaning handguns, it is much too small to clean any rifles or shotguns on. This certainly isn’t a problem if all you own are handguns (which many people do) but if you are wanting a mat that can be used to clean all of your firearms, you are going to have to look elsewhere. Another simple solution to this problem is to simply purchase another cleaning mat. You certainly are not limited to a single mat, and this mat is very affordable. Add in the fact that it has a very detailed and informative print of a double stack 9mm Glock, and I would highly recommend this mat for any Glock owner, even if you do end up having to purchase another mat for your rifles. If you have quite the collection of large firearms and are looking for a mat that is big enough to fit all of them, then this cleaning mat from Tipton might be just the ticket. It is one of the largest mats available, and measures a whopping 54 inches (4 and a half feet) long! That should be more than enough to clean all but the longest firearms. 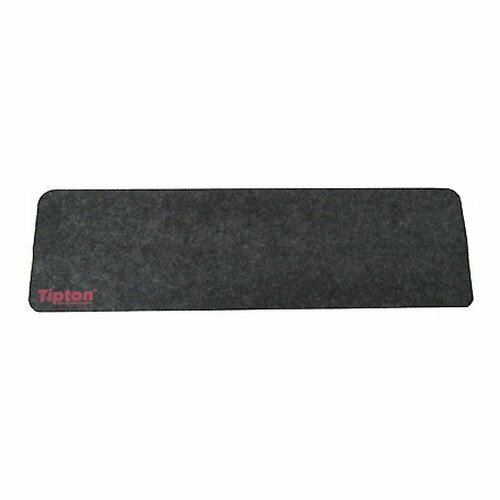 This mat is made of a dark gray felt top which is glued to a neoprene backing. This causes oil and solvent to be soaked into the felt covering of the mat. Because of this, the mat is machine washable and is flexible, which allows it to be rolled up and stored easily. This mat does have a few downsides. The felt top absorbs liquids and is very prone to staining. This can be a nice feature if you are worried about solvent or oil running off the mat and onto your table, but I much prefer a mat that doesn’t need washing after every spill. It is also only ⅛ inch thick, which can be a bit thin when it comes time to clean the long, heavy firearms that this mat was designed for. One final (albeit small) downside is that this mat comes with a plain gray top, and is not printed with any cool designs. All things considered, this is a good mat and I wouldn’t hesitate to recommend it to anybody with extra large firearms to clean. The 1911 has been an iconic piece of American history since it was first designed and built by the famous John Moses Browning. Even today, over 100 years later, it still has a loyal following in the self-defense and competition circuits, and it seems like just about everybody owns one in some form or another. 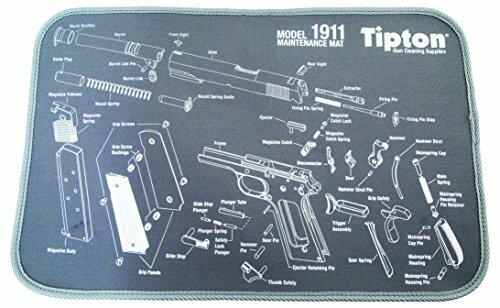 If you find yourself in this category, then this 1911 maintenance mat from Tipton will be an excellent addition to your cleaning kit. Unlike many simple, modern handguns, the 1911 has quite a few small parts and a rather complicated construction. This mat shows a breakdown of every single individual part. This can be a lifesaver if you are doing a detailed, full disassembly cleaning, or are trying to build a 1911 of your own. The only downside to this mat (much like the Glock cleaning mat) is that this is really only useful for handgun cleaning. 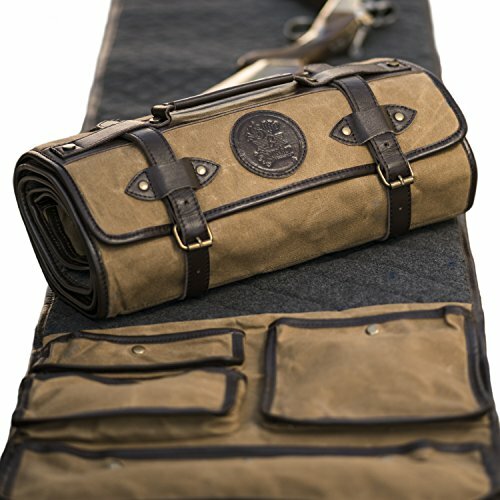 This mat is 11” by 17”, which is the perfect size for cleaning your 1911, but not quite big enough for a rifle. Still, this mat comes in at a very affordable price point, which makes it a great addition to your gun cleaning kit. The screen printed surface is sharp and clear, and very solidly stitched to a neoprene backing. This mat does have a tendency to get a bit dirty but is easily washable by hand. Overall, I would highly recommend this mat to anybody who owns a 1911. 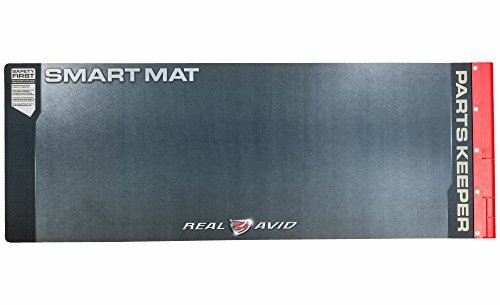 If you are looking for one simple mat that is big enough to clean almost all of your guns but is still loaded with features, then this universal smart mat from Real Avid is worth a solid look. This mat provides the best of both worlds, with a non-slip neoprene backing a waterproof cover. This gives you the cushion of neoprene, with the water resistance of silicone. Any oil or solvent that drips on this mat will simply bead up and is easily wiped away with your gun cleaning rag. This mat is 43 inches long by 16 inches tall, which is long enough to fit all but the largest military surplus rifles. It also rolls up easily after cleaning for quick and convenient storage. One of the greatest features of this mat is the magnetic parts tray included at the end. Almost every firearm contains a plethora of tiny parts and springs, and they are all very easy to lose (I have to admit, I am guilty of this myself). Having a magnetic parts tray at the end of a cleaning mat helps me keep pins, screws, and springs from rolling away on to the floor. In my opinion, this is one of the greatest features of this mat and really sets it apart from a lot of the competition. In fact, the only real downside to this mat is the lack of a screen print on the surface. 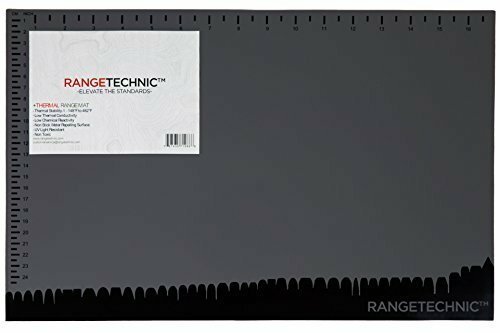 If the thought of a neoprene mat doesn’t tickle your fancy, or you need something with a good heat resistance, then this silicone mat from Rangetechnic might be a good choice for you. The silicone rubber mat is resistant to temperatures up to 482 degrees Fahrenheit, which means you won’t have to worry about placing hot firearms on it at the range, and it also doubles as a hot pot holder! The silicone is 100% waterproof, which means you won’t have any worries about solvent or oil seeping through onto the table. To top it all off, this mat is made in the USA, so you know it is going to be high-quality, as well as supporting an American company. The main downside to this mat is the size. At the moment, the 11”x17” size is all they have listed, which is really only good for cleaning handguns. Hopefully, they add some larger sizes to their product line in the future. It also doesn’t have any fancy screen printing, which can be either a good or a bad thing for you. It does include a ruler along the side that has both inches and centimeters, which can come in handy. Overall, this is a great mat for handgun cleaning and liquid resistance. If cost is not a factor for you, and you want a cleaning mat that is much more than just a gun cleaning mat, then this may be what you are looking for. This Sage and Braker Waxed Canvas Mat boasts by far the largest dimensions, coming in at 16 inches tall and 69 inches (almost 6 feet) long! It is constructed of heavy waxed canvas for the cleaning surface, thick leather for the bottom, and heavy wool for the padding between the 2. One of the main attractions for this kit (besides the incredible aesthetics) is the leather pouches at the end for your cleaning supplies. With this mat, you can ditch the awful case that came with your cleaning kit, and store all of your cleaning supplies in the mat itself! This makes it very handy for trips to the range and makes your entire cleaning setup easy to store and portable. This mat is not without downsides, however. The most obvious one being the price. This mat comes in at roughly 10 times the cost of the cheaper mats. The waxed canvas surface is also far less water-repellent than silicone. While this mat was designed in the US, they do work with a supplier from China for production, so if you want to deal with strictly American companies, you may want to avoid this mat as well. Overall, this is a fantastic mat that performs exactly how you would expect a mat that costs this much too. You certainly aren’t wasting your money on this cleaning mat, but if you are on a limited budget you may be able to find better ways to spend that cash. Let’s face it: if you want to clean your guns AND not have to sleep in the doghouse, you are going to need a gun cleaning mat. In order to keep from leaving any dents or stains on your table, you are going to need a mat that is thick enough to provide good cushion, water resistant to avoid oil seeping through, and a good place to store your parts to prevent them from rolling away. While all of the gun cleaning mats listed will work great for most purposes, there is one that stands out above them all. The Real Avid smart mat has every feature you could want in a gun cleaning mat, with the major added bonus of being very affordable. If I could only have one gun cleaning mat, it most certainly would be this universal mat. Now that you have all the information that you need, it’s time to go out and purchase the best gun cleaning mat for your needs today!